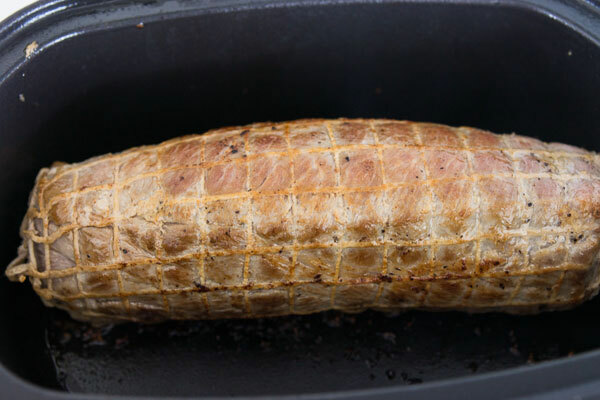 Contrary to popular opinion, pork tenderloin actually has about the same amount of fat as chicken breasts, and less cholesterol, making it an excellent alternative to serving chicken at your next dinner party. Of course the lack of fat makes it easy to turn it into a tough flavorless log of meat, so it’s crucial that you don’t overcook it. If you don’t have one, go get an instant read thermometer. They’re inexpensive, compact, and take the guesswork out of gauging temperatures, whether you’re making a custard or grilling a steak. To help make sure the roast cooks evenly, take it out of the fridge about half an hour before you cook it. This allows the meat to rise in temperature, before applying any heat, making it easier to get it up to an internal temperature of 145 degrees F without overcooking the exterior. It’s also important that you use a tenderloin that’s been tied into an even thickness from end-to-end. Otherwise, the tapered ends will turn into jerky by the time the center is cooked. In the flavor department, I like to apply a dry brine of garlic, salt, and pepper to the tenderloin a day before roasting it. This ensures that the meat is seasoned to the core, while concentrating the flavors of the pork by extracting excess moisture from the meat. It also provides a wonderful contrasting base when you glaze the roast with sweet and sour pomegranate molasses. Served with onions that have been caramelized in the meat juices, along with a bright tangy salad, this dish makes for a complete meal that’s easy to prepare and not nearly as heavy as the name may imply. While the leftovers make a great sandwich, if you don’t need a whole roast, these brined pork chops are just as delicious with this salad and can be made in smaller portions. Not a pork eater? Try substituting a lamb roast for the pork loin. 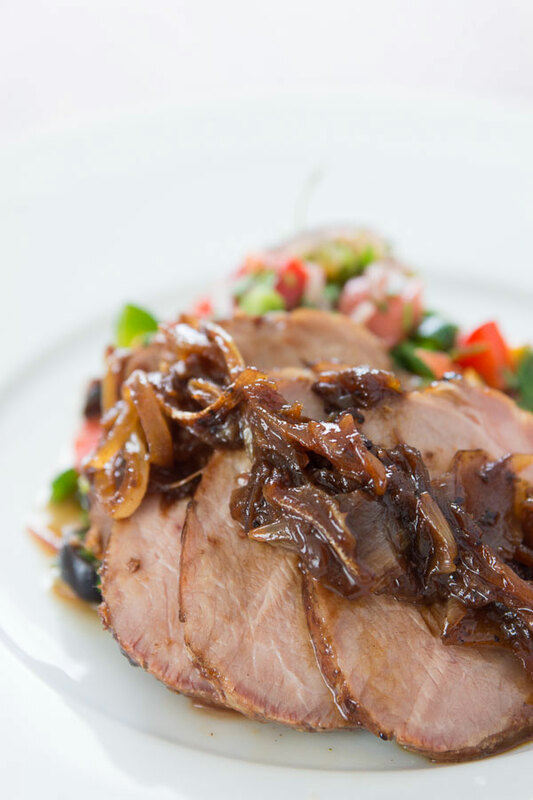 Fuse the succulence of a pomegranate with juicy pork for a delectable entree. 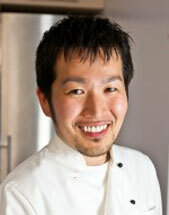 Food blogger Marc Matsumoto shares his tips for brining pork before roasting in a full post on the Fresh Tastes blog. The day before you plan to make the roast, combine the garlic, salt and black pepper in a small bowl and mix to combine. Rub this mixture all over the outside of the roast. Cover and refrigerate overnight. Remove the roast from the refrigerator 30 minutes before roasting. This allows the temperature of the roast to rise, so it cooks more evenly. Put the oven rack in the middle position and preheat to 350 degrees F (180 degrees C). Put a roasting pan or skillet just large enough to hold the roast on the stove and heat until hot. Add 1 tablespoon of vegetable oil, and then add the roast. Allow the roast to form a brown crust on the bottom, then use tongs to turn it a little bit at a time. Repeat, allowing each surface to brown, until the roast is nicely browned all around. Add the sliced onions around the roast, and then use a spoon to spread 2 tablespoons of pomegranate molasses evenly over the top of the roast. Put the pan in the oven and bake until an instant read thermometer registers 145 degrees F (62 C) when inserted into the thickest part of the roast (35-45 minutes). 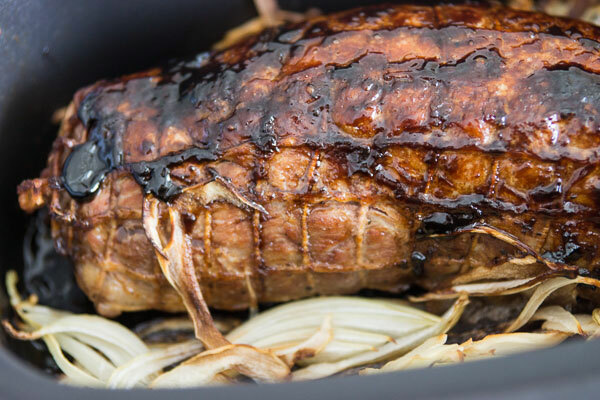 Once the roast is done, remove it from the oven and place the roast on a cutting board and allow it to rest while you finish the onions and make the salad. 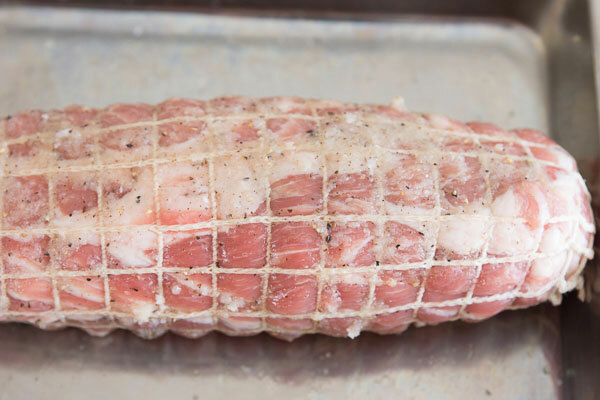 This gives time for the proteins in the meat to relax, allowing the moisture to absorb back into the meat fibers rather than running all over your cutting board. Put the roasting pan on the stove and add the wine to deglaze the pan, scraping up all the browned bits from the bottom of the pan. Turn on the heat and boil the mixture until the onions are tender, and the liquid has turned into a thick, dark glaze. For the salad, put the sliced red onions in a bowl and rub with the sumac. 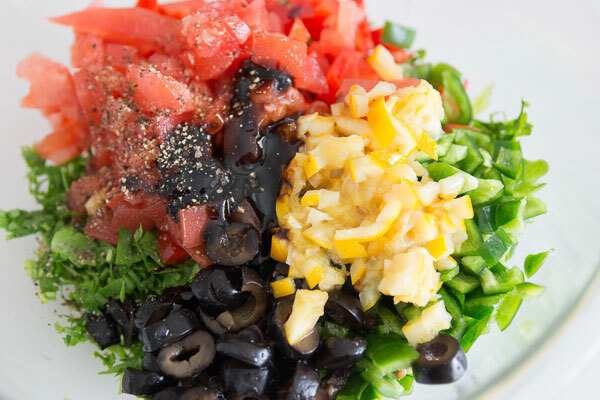 Add the tomato, red bell pepper, green bell pepper, black olives, lemon, flat-leaf parsley, and pomegranate molasses. Toss to coat evenly. To serve, remove the string from the pork and slice. 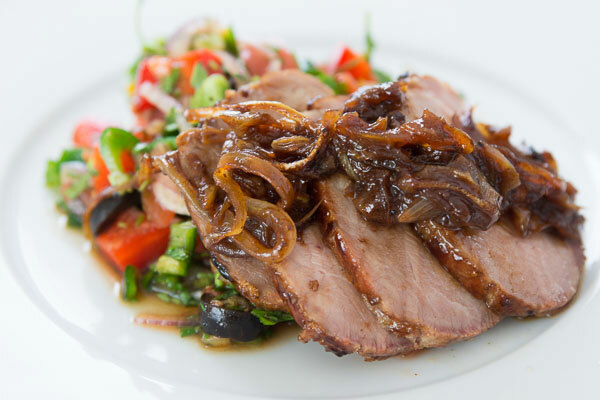 Serve the pork topped with the caramelized onions and with a side of salad.